We’d love your help. Let us know what’s wrong with this preview of The Great and Only Barnum by Candace Fleming. Discover the true story of P.T. Barnum, the man who created the world-famous Barnum & Bailey Circus, as featured in the movie The Greatest Showman! 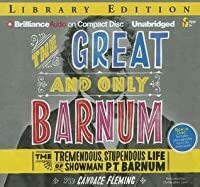 The award-winning author of The Lincolns: A Scrapbook Look at Abraham and Mary, Amelia Lost, and Our Eleanor brings us the larger-than-life biography of showman P. T. Barnum. Known far and wide for his jumbo elephants, midg Discover the true story of P.T. Barnum, the man who created the world-famous Barnum & Bailey Circus, as featured in the movie The Greatest Showman! To ask other readers questions about The Great and Only Barnum, please sign up. I am not a fan of PT Barnum which is heresy when you’ve lived in Bridgeport, CT. I understand my sensibilities about the commercialization of the unfortunates and his out and out frauds (George Washington’s nanny for one) are "modern" and that the times were different. I understand that he provided work for many that others would not in an era with no safety net programs. He was a far sighted entrepreneur, bouncing back after losses to build the iconic American Circus; he even built his own rail I am not a fan of PT Barnum which is heresy when you’ve lived in Bridgeport, CT. I understand my sensibilities about the commercialization of the unfortunates and his out and out frauds (George Washington’s nanny for one) are "modern" and that the times were different. I understand that he provided work for many that others would not in an era with no safety net programs. He was a far sighted entrepreneur, bouncing back after losses to build the iconic American Circus; he even built his own railroad cars to bring the circus to far flung communities. He is still to "too" for me to celebrate. While I don’t gravitate to Barnum literature, I wanted to how he would be interpreted for contemporary young adult readers. Fleming presents Barnum’s subjects with respect. You draw your own conclusions about how exploited they were. There is a picture of his long suffering wife, Charity Barnum. The facts of how he wed so soon after her death and kept it a secret are not hidden from today's youth as they might have been a generation ago. Interesting how people’s fascination with shams and the absurd continues even today. I believe Barnum would have had a field day producing reality TV shows. I loved this book! What a fascinating person Barnum was! Felt sorry for his wife, though, who looks sooo depressed in the photo on page 76. It's a darn shame that his two museums burned down. Fleming makes you feel as if you're touring through his first museum in chapter 4, proceeding from the entrance into each "saloon," as he called his exhibit rooms, and the theatre ("moral lecture hall") and finally out onto the street. Barnum was a master selling things and ideas to people, even when it was I loved this book! What a fascinating person Barnum was! Felt sorry for his wife, though, who looks sooo depressed in the photo on page 76. It's a darn shame that his two museums burned down. Fleming makes you feel as if you're touring through his first museum in chapter 4, proceeding from the entrance into each "saloon," as he called his exhibit rooms, and the theatre ("moral lecture hall") and finally out onto the street. Barnum was a master selling things and ideas to people, even when it was all "humbug." I wish I could go back in time and visit some of his exhibits and view some of his acts. I'd also love to travel to Bridgeport, Connecticut, to see the Barnum Museum there. I read this after seeing the musical The Greatest Showman which left me hungry for all things Barnum. Reading about the showman’s actual life was almost as exciting as the wonderful film. I could not put this book down! I had things to do but it didn’t matter; I kept right on reading. Barnum was not a perfect person, but he was exceptional in many areas: business, showmanship, vision, imagination. Reading about his life was like going on a wild rollercoaster ride. The author is very talented at making readers feel like they are actually walking through the American Museum in 1840s New York City. She details every stage of Barnum’s life, as well as his comrades, coworkers, friends, and enemies. Barnum experienced so much and truly changed the entertainment industry as well as people’s lives. He gave people labeled “oddities” a well-paying job and a chance to educate the world about their conditions. He re-invented the idea of a museum, and made traveling circuses more efficient. He made the public happy, but sometimes abandoned his family in process. He got bored in retirement and never stopped working until the end. There is just so much to learn about him. I never knew that someone could have so many properties burn down in a lifetime. But, hey, it was the 1800s; anything could happen. 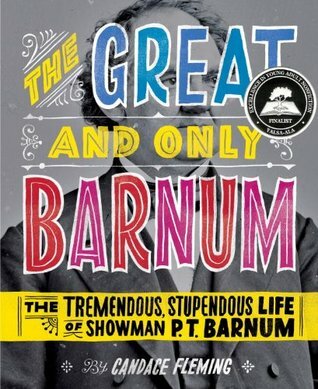 Great biography of PT Barnum. It was a well documented account of a very interesting man. A loving family man or a single-minded entrepreneur? An animal lover or cruel ringmaster? Candace Fleming presents well-researched facts, documents, and photographs to reveal the life of P.T. Barnum, allowing the reader to come to their own decision. A middle grade reader might pick this for a biography report or if they are interested in oddities and/or the circus. I thoroughly enjoyed this quick, entertaining read. It was incredible to learn P.T. 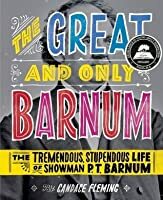 Barnum's history, from growing up with a prankster grandfather through his opening of the American Museum, tours of Europe with Tom Thumb, and his grand finale of the Greatest Show on Earth. Barnum raked in the dough fooling America's citizens and seemed to enjoy every minute of it - as did the citizens! No one seemed to mind his "humbuggery" a bit. One of the facts I found most interesting was, during the beginn I thoroughly enjoyed this quick, entertaining read. It was incredible to learn P.T. Barnum's history, from growing up with a prankster grandfather through his opening of the American Museum, tours of Europe with Tom Thumb, and his grand finale of the Greatest Show on Earth. Barnum raked in the dough fooling America's citizens and seemed to enjoy every minute of it - as did the citizens! No one seemed to mind his "humbuggery" a bit. One of the facts I found most interesting was, during the beginning of the circus, the SPCA filed claim against Barnum for abuse of animals. Barnum, aghast, countered the gentleman head-on, to prove that contrary to popular belief, the animals were loved and cared for as best as possible. In fact, many zoologists and caretakers of exotic animals contacted Barnum for the best way to take care of these beasts! Barnum, in his quest to convince the SPCA of his altruistic mission, proved himself. He became close friends with the crusader, and eventually came to sit on the board himself donating large sums of money to the organization in order to help care for animals that were mistreated. I don't know how well the treatment of circus animals has been kept up, but it is certainly a fascinating tidbit considering the crowds of protesters outside many performances of the Circus today! We can thank Barnum for today's paparazzi-craze: his introduction of Swedish singer Lind to the US brought on the first media frenzy over celebrity (which he created single-handed by paying the reporters!). Her name was the first ever whose celebrity status was used to endorse products and services. I’m trying to work out why exactly this is the only children’s biography of P.T. Barnum I remember having seen before. I’m sure there are others. If I could just lift my lazy fingers high enough to type in “P.T. Barnum” into my library’s catalog system I’m sure I’d find a couple. But why only a couple? Why isn’t Barnum as popular a topic as, say, Houdini? Both spent their lives bamboozling people, one way or another. But where Houdini got off looking like a star, people are awfully mixed on Barn I’m trying to work out why exactly this is the only children’s biography of P.T. Barnum I remember having seen before. I’m sure there are others. If I could just lift my lazy fingers high enough to type in “P.T. Barnum” into my library’s catalog system I’m sure I’d find a couple. But why only a couple? Why isn’t Barnum as popular a topic as, say, Houdini? Both spent their lives bamboozling people, one way or another. But where Houdini got off looking like a star, people are awfully mixed on Barnum. Which, I suppose, answers my own question. Why aren’t there that many children’s bios of Mr. B? Probably because he wasn’t a very good man or a very bad man. He was just a very talented man with a fair amount of problems. The kind of guy who loved children... and was, for a time, an alcoholic who would leave his wife to faint in public. Who fought for the right for blacks to vote... and owned a slave. Multifaceted people don’t end up in children’s biographies all that often because it takes a dedicated author to have the guts to show the bad alongside the good. Guts like Candace Fleming’s got. Guts like what you’d find in The Great and Only Barnum. It’s nice when a life has a defining moment in it. P.T. Barnum’s apparently came when, as a kid, he discovered that his inheritance from his practical joker of a grandfather was a swampy snake-infested spit of land. Meant to humble young Tale and turn him into a hard worker, the plan backfired. Instead the lad fell in love with bamboozling and practical jokes. Born in 1810, young Tale had already learned that he wasn’t much for manual labor. Nor, for that matter, was he cut out to work in shops or behind desks. If it bored him, he wasn’t interested. Maybe that’s why he got into the business of showmanship. He started out by exhibiting a woman he claimed had been George Washington’s nursemaid. From there he went on two build two magnificent museums of wonder and buffoonery, tour the 19th century pop star Jenny Lind, serve on the Connecticut state legislature, and help to create the greatest show on earth, the Barnum and Bailey Circus. Love him or hate him, there’s no denying that Barnum was a uniquely American character, with a truly interesting life. An extensive Bibliography (including websites), and Source Notes are included. The book is told in a straightforward manner, generally telling Barnum's tale chronologically. Considering the subject matter, however, Fleming is free to indulge in some enjoyable elements. For example, at one point the book is laid out in a manner similar to Barnum’s museum itself. Readers step into each saloon and hear about what one could find there. Those of us familiar with the musical Barnum (yay, Jim Dale!) would even be able to recite the things one found from The Museum Song (“Quite a lotta Roman terra cotta . . .). Of course the modern reader may feel superior to their historical brethren, but Barnum’s Museum was just an ancestor of today’s Ripley’s Believe It Or Not Museum or the “educational” Bodies... The Exhibition which travels the country. Say what you will about Barnum, while he may have taxidermied people’s pets while they waited, he never went so far as to do the same for actual human beings. So why are we even reading about this guy? Because he’s fascinating. A guy who had his good and bad points. To watch Fleming do the dance of explaining the man, not covering up his lesser qualities, and still presenting him as a kind of charming cad is mesmerizing. She’s writing for kids and teens as her primary audience, yes? Then that means putting in some rather adult materials, without going into the delicate details. Barnum had a good friend in a Phoebe Cary, with whom he remained close for twenty years while married, until she died. On that subject we would only be able to speculate anyway. Fleming does not delve or suppose. Just the fact, ma'am. Is she an apologist for Barnum? I struggled with that question all through the book. When explaining that Barnum only claimed to be renting Ms. Joice Heth from her real “owner” Ms. Fleming answers more honestly than the man himself in saying, “But even if he didn’t technically own Joice, he still acted like her master. He displayed the tired old woman before the public. And she had no choice but to submit.” She never damns him directly. Never says, “Here is a bad man for such n’ such a reason.” She could many times over if she wanted to. His museum only let in blacks on specific days and times. His animals died in a variety of ways. You could villainize him or saint him depending on your mood. Fleming does neither. She simply displays him, warts and all, to the child readers and allows them to make up their own mind on the matter. Why do we like him? I dunno. Maybe it was the good-natured quality of his pranks. How do you help but smile when you hear how for the opening of his museum he placed the worst possible musicians on his roof so that people could only flee the sound by going INTO the museum. He paid his “Human Curiosities” a generous salary. He said of them that when people met them in his museum, “I want folks to say ‘what an amazing person’ not ‘there but for the grace of God go I.’” His menagerie “was not well cared for” but he was so well informed about animals for his time period that folks from the American Museum of Natural History would actually ask him for advice regarding animals. Fleming has done her research too. Readers are left with very few questions by the end of her tale. There was really only one moment when I was left hankering for more facts. Early in his career and without a penny to his name, Barnum hit upon the idea of creating his infamous Museum. To buy it on credit he put up his worthless spit of land, Ivy Island. That’s all well and good, but then he filled the museum to brimming with people, animals, exhibits, you name it. He even went so far as to cover the museum in painted plaques, flags from numerous countries, premier New York's first spotlight, and hire a brass band on its opening day. So how on earth did a man without much in the way of money get all of this? Credit? If so, Barnum was as savvy a businessman as you could ever hope to find in American history. But it’s a mystery that remains unanswered here. Mark Twain despised him. People loved him. He fooled men, women, and children alike. One minute he was bringing his circus to small children. The next he was attempting to buy the American side of Niagara Falls so that he could build a fence to prevent one side from seeing it without paying. He insisted that blacks be given the right to vote because “A human soul is not to be trifled with,” then turned around and exhibited the Chiefs of the Nine [Indian:] Nations along with other “Human Curiosities”. He is repugnant and compelling by our modern standards and he has left his mark on the American landscape, for good or ill. Children’s biographies are not always about saintly people. Once in a great while they are about complex characters. And as you will find, they don’t get much more complex than Phineas Taylor Barnum, King of the Humbugs. The recent film (bio-pic) The Greatest Showman piqued my curiosity about this man, which led me to this 142 page biography replete with photographs and sidebar commentary. What I learned is that the bio-pic is very much a fictional story inspired by the life of P.T. Barnum. Which is perfectly okay. However, I am very happy that it led me to learn more about this fascinating person and his life's output. I highly recommend both the book and the film. I typically do not enjoy biographies but this was a wonderful read. At first I did not think Barnum was a good person but in the end I was convinced otherwise. If you are looking for a good biography to read this is a great choice. I loved everything about this biography. The information provided wasn't overly detailed and unnecessary, it simply tells the story of a great showman. Interesting look at a morally questionable man. So after watching The Greatest Showman, I wanted to learn more about P.T. Barnum. This middle grades biography is the only thing my library had to offer. But it ended up being really good. Just enough information on most of the areas I wanted to learn more about/compare movie vs. fact. It was very readable, well organized, and contained great pictures. Interesting, and a quick read. What a superbly put together book. Fleming shows off everything that was magical, mythical, and morally corrupt about Barnum with impeccably well-researched prose and a treasure trove of images. I'm not sure whether I adore him or despise him after reading this book, but he's certainly fascinating. Barnum grew up in a rural area of New England and got his start running good-natured con games after it was clear that he would be useless at farm labor. His first big break came after he had moved his What a superbly put together book. Fleming shows off everything that was magical, mythical, and morally corrupt about Barnum with impeccably well-researched prose and a treasure trove of images. I'm not sure whether I adore him or despise him after reading this book, but he's certainly fascinating. Barnum grew up in a rural area of New England and got his start running good-natured con games after it was clear that he would be useless at farm labor. His first big break came after he had moved his family to New York. He caught wind of a woman who was said to have documents proving that she was 161 years old and had been a slave on George Washington's father's plantation. He promptly bought her as his own slave and put her on display, inviting people to purchase tickets to see and talk with the "oldest woman alive." Barnum's rise to fame is full of stories like this: instances where Barnum's enthusiasm for the show that he was putting on and the audience's wonder in seeing it rests side-by-side with the moral and ethical complications of his actions. What I didn't know going into this book was that Barnum's career was actually based around a "museum" of wonders that acted as his home base for many years. Learning about how he put his museum together, and seeing and reading about the exhibits and people in it, was even more interesting after reading Brian Selznick's new book Wonderstruck earlier this year, which delves a lot into the evolution and early history of museums. IOt turns out that the circus didn't some until much later in his career--in Barnum's 60s when he had technically retired. But like so many things, he put his own complicated stamp on it, and ended up transforming it altogether. Barnum seemed to remain a truly optimistic and idealistic man throughout his life, which makes all the controversy that this book dredges up all the more interesting. He had a way of putting a positive spin on everything, and seeming to truly believe the stories he would tell other people and himself, whether it was with regard to the treatment of his animals, his relationship with the various people he employed, his lack of attention to his family, his tricking people about what they were seeing, or any of the other many schemes he undertook. I did pretty much read this book through in one sitting. It is definitely readable - written in a straightforward style. The literary artistry and aesthetic appeal were lacking for me - the layouts were simple and the entire text is black and white which I thought was odd when you think about Barnum's work- it was probably filled with amazing color. The black/white contributed somewhat to the authority, though - because most of the pictures were of primary sources - pictures of Barnum and the cu I did pretty much read this book through in one sitting. It is definitely readable - written in a straightforward style. The literary artistry and aesthetic appeal were lacking for me - the layouts were simple and the entire text is black and white which I thought was odd when you think about Barnum's work- it was probably filled with amazing color. The black/white contributed somewhat to the authority, though - because most of the pictures were of primary sources - pictures of Barnum and the curious people who were part of his American Museum. What I think is important about this text - even though there was not a lot of text devoted to these topics - was how the author develops Barnum as a complex human being. He's not portrayed as perfect or even "wonderful." I think the words for the title were carefully selected now that I think about it. He was a racist - the way he treated Joice Heth ("rented" her from her slave owner) and African Americans (free in NYC) were only allowed into his museum at certain times. He was a terrible husband for most of his marriage to Charity. Although, this was probably part of his socialization - he did not rise above it. With the "curious" people who worked for him, though, he did not ask them to pose and be viewed, he asked them to walk around and talk to people so people would see them as humans; he paid them well and gave them living quarters. With the animals that were on exhibit - Barnum was part of the growing knowledge of zoology. Many of the animals he owned died and he just replaced, but the author writes that he searched out answers regarding care of these creatures and contributed knowledge to the field as he grew to understand the care they needed. In the end, he was very business driven and focused for decades on "entertainment"; he did not get into the circus business (with Coup and then Bailey) until the last decade or so of his life (he lived to be eighty) and he focused on BIG entertainment (Jumbo was his elephant) and added two rings to the circus acts that seated 12,000 people - thus the "three ring circus." APA Citation: Fleming, C. (2009) The Great and Only Barnum: The Tremendous, Stupendous Life of Showman P. T. Barnum. New York: Schwartz & Wade. The fast-paced, visually appealling format of this book feels like a visit to Barnum’s greatest show on earth itself! 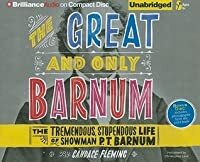 Filled with photographs and sidebar notes that pull at the reader like a carnival hawker calling the circus-goer from one side of the midway to the other, Fleming sets the pace for a peek at the life of PT Barnum, a man who often seemed larger than life. From humble childhood beginnings in a small Connecticut town to international tours which include visits with European royalty, the reader travels through the many stages - both figurative and literal - of Barnum’s life. Well known in the modern age as a circus man, the book explores in-depth Barnum’s start in show business - running the American Museum (comparable to a modern day Ripley’s Believe It or Not attraction) in New York City. Images of 19th century advertising, photographs of the building and it’s “Representatives of the Wonderful” - Siamese twins, living skeletons,the giantess Anna Swan - are abundant and transport the reader to a different time and place. P.T. Barnum is probably best known as a founder of the Barnum and Bailey circus, but readers may be surprised to learn that was one of the last things he did. Barnum had a knack for show business and marketing, and knew just what to do to lure customers in. He spent many years collecting exhibits and exotic people for his American Museum, then worked with a number of circuses before finally partnering with Bailey. His life story is a fascinating look at how one man change the face of entertainme P.T. Barnum is probably best known as a founder of the Barnum and Bailey circus, but readers may be surprised to learn that was one of the last things he did. Barnum had a knack for show business and marketing, and knew just what to do to lure customers in. He spent many years collecting exhibits and exotic people for his American Museum, then worked with a number of circuses before finally partnering with Bailey. His life story is a fascinating look at how one man change the face of entertainment. This review has been hidden because it contains spoilers. To view it, click here. A fantasic look at the life of America's premier Showman. In clear, accessible text, Fleming begins her story just before Barnum's birth and ends just after his death. Reproductions of photographs, engravings, posters, and other images appear throughout the book, providing exactly what visitors to his museum(s) came for - a chance to see the wonders with their own eyes. Unfortunately, many of these images, particularly those of posters and engravings that feature a good amount of text, are very A fantasic look at the life of America's premier Showman. In clear, accessible text, Fleming begins her story just before Barnum's birth and ends just after his death. Reproductions of photographs, engravings, posters, and other images appear throughout the book, providing exactly what visitors to his museum(s) came for - a chance to see the wonders with their own eyes. Unfortunately, many of these images, particularly those of posters and engravings that feature a good amount of text, are very small and hard to read. Fleming relates the high and low points of Barnum's life and career. Here and there, she notes practices (like the exhibition of Joice Heth) that were socially acceptable at the time, but would not be so now. More often, she lets Barnum's actions speak for themselves. Packed with fun facts, this scrapbook-style biography will appeal to middle-grade readers and, more than likely, quite a few adults. It is a book that Barnum himself (who, as Fleming mentions, requested that his obituary run while he was alive, so he could read it in the paper!) would have enjoyed. Endnotes and a bibliography point those who interests have been piqued to further reading on Barnum and/or the circus. The subtitle, "The Tremendous Stupendous Life of Showman P.T. Barnum" perfectly describes this excellent biography that reads like an exciting story. Fascinating look at a man who was both an innovative, creative businessmen and an absent father. The book captures the museum and circus he created so vividly, it makes you feel like you were there. Fun sidebars explain things such as "Mr. Proler's Secret Recipe for Bear Grease" or "Museums Now and Then." "What, he asked, was wrong with 'puffing up the truth'? Why couldn't he put a 'coat of varnish on the hard facts of life'? Besides, he argued, people liked to be on the receiving end of a practical joke. They liked to be 'humbugged.' By a humbug, he meant something fake that is packaged and advertised so cleverly that people think it is real. 'I don't believe in duping the public,' he further explained. 'All my humbugs are used as skyrockets. That is, they are used as advertisements to draw attraction to the museum...Anyone humbugged by me gets their money's worth.'" I was amazed by this book - first in that it was easy to read, had tons of fabulous pictures, and never once did I lose interest. This is a hard mixture to attain in the world of biographies - especially for children. I'm doing to look for other books by this author. She did an amazing job - just reading her bio at the end for the amount of work she put into this makes me respect her a great deal. Definitely a book I would recommend to anyone with an interest in the circus. I don't often read biographies, but I enjoyed this one immensely. It is not only about P. T. Barnum, but about his museums and circus. I have always been a storyteller. Even before I could write my name, I could tell a good tale. And I told them all the time. As a preschooler, I told my neighbors all about my three-legged cat named Spot. In kindergarten, I told my classmates about the ghost that lived in my attic. And in first grade I told my teacher, Miss Harbart, all about my family's trip to Paris, France. I told such a good st I have always been a storyteller. Even before I could write my name, I could tell a good tale. And I told them all the time. As a preschooler, I told my neighbors all about my three-legged cat named Spot. In kindergarten, I told my classmates about the ghost that lived in my attic. And in first grade I told my teacher, Miss Harbart, all about my family's trip to Paris, France. I told such a good story that people always thought I was telling the truth. But I wasn't. I didn't have a three-legged cat or a ghost in my attic, and I'd certainly never been to Paris, France. I simply enjoyed telling a good story... and seeing my listener's reaction. Sure, some people might have said I was a seven-year old fibber. But not my parents. Instead of calling my stories "fibs" they called them "imaginative." They encouraged me to put my stories down on paper. I did. And amazingly, once I began writing, I couldn't stop. I filled notebook after notebook with stories, poems, plays. I still have many of those notebooks. They're precious to me because they are a record of my writing life from elementary school on. In second grade, I discovered a passion for language. I can still remember the day my teacher, Miss Johnson, held up a horn-shaped basket filled with papier-mache pumpkins and asked the class to repeat the word "cornucopia." I said it again and again, tasted the word on my lips. I tested it on my ears. That afternoon, I skipped all the way home from school chanting, "Cornucopia! Cornucopia!" From then on, I really began listening to words—to the sounds they made, and the way they were used, and how they made me feel. I longed to put them together in ways that were beautiful, and yet told a story. As I grew, I continued to write stories. But I never really thought of becoming an author. Instead, I went to college where I discovered yet another passion—history. I didn't realize it then, but studying history is really just an extension of my love of stories. After all, some of the best stories are true ones — tales of heroism and villainy made more incredible by the fact they really happened. After graduation, I got married and had children. I read to them a lot, and that's when I discovered the joy and music of children's books. I simply couldn't get enough of them. With my two sons in tow, I made endless trips to the library. I read stacks of books. I found myself begging, "Just one more, pleeeeease!" while my boys begged for lights-out and sleep. Then it struck me. Why not write children's books? It seemed the perfect way to combine all the things I loved: stories, musical language, history, and reading. I couldn't wait to get started.